But I have learned something, so this experience was not in vain. I am now cured of my apprehension, and will read your book again, Tim , as this is a true analysis of prophecies. You have shown insight without embroidering scriptures, showing the sequence of Old and New Testament prophecies. Ahh, the "it's very rare" card... It's fitting he mentions the four blood moons/tetrads theory  because rarity was the main argument of legitimacy for that theory, too. Many people believed in the four blood moons based on that rationale. However, once the last blood moon passed, the theory was relegated to the same trash heap where all invented prophecy theories have ended up. They all fail to predict anything specific in any specific timeframe because men cannot accurately predict the future, even when improvising from a Biblical basis. This article covers the Sept 23 rapture/tribulation speculation. For why David Meade's Planet X prediction October 21, 2017 (incorrectly reported in the news surrounding Sept 23) will fail, see my review of his book . The Star of Bethlehem conjunctions before 3 BC led the Magi to depart in time to come see the baby Jesus. For more on Jesus' birth in Rev 12 and the Star of Bethlehem before that, see Ernest Martin's excellent free book . 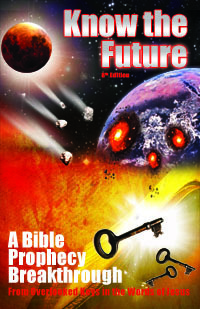 Another issue is that there is no rapture in the Bible before the Great Tribulation . Therefore Revelation 12:5 cannot be the rapture (of anyone) when the 3½ year Great Tribulation (Rev 12:14) comes later chronologically in the narrative. As a reminder, the Great Tribulation is which Satan tries to attack the church (Rev 12:13-16). Put another way, only a pretrib rapture theorist could ever entertain this theory. Those who know the rapture comes post-tribulation would have to reject this theory based on the Great Tribulation still being future both in Revelation 12 and September 2017. The simplest explanation for all this is that the Woman is the faithful church of God among and from whom Jesus, a male individual, was born (through blessed Mary). Jesus ascends to heaven and the faithful continue on the earth for centuries until and through the Great Tribulation . It's true that the Star of Bethlehem must have been a rare event. It had to be for the Magi to see it and know it was the time to pick up and travel hundreds of miles to meet Jesus. But I can assure you they did not risk that dangerous journey just because they saw something rare or unique in the sky and decided by themselves what it meant (like our modern Christian prophecy speculators do justifying this by taking Genesis 1:14 out of its "day, month, year/calendar signals" context to make it about a "heavenly billboard of prophetic signs" ). Ignore the unscriptural "rarity" argument for this and all prophecy theories. (Heck, just forget invented end time sign theories completely and listen to what Jesus said was the one precursor end time sign  in Mt 24:14). Don't worry, you don't have to. Author Joel Richardson is another person like the astronomer I quoted above  who took the time to fact check the astronomy work of Scottie Clarke . He compared the claim to what the astronomy software results (skip to 34:00  mark). He found "9 months" was a gross misrepresentation. Jupiter actually goes in in November, 2016 and stays in the Woman only until May, 2017 = five or six months! After Jupiter exits it returns around three months later. 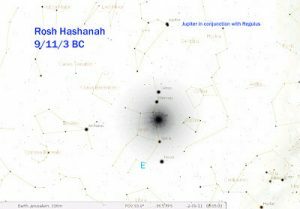 If you are generous and allow a baby going in and out of a womb and add up the entire time that Jupiter is near or in the woman consistently by the lines of the body, you come up with a period of eleven or twelve months, not nine months. Hardly the representation of human gestation. Speaking of the four blood moons, if you get nothing else from this article, the one point I want you to take away is the same point I made about that prophecy theory. The demonstrable rarity of an event does not equate with divinity or prophetic significance! That is the underlying false assumption of both the failed four blood moons theory  of 2015 and this Revelation 12 theory for 2017. Nowhere does the Bible tell us to look for rare events for signs of the end. Instead, it tells us specific events that will start the end , which have nothing to do with Revelation 12 showing us only events from the latter half of the 70th week (Satan coming down and chasing the saints who God gathers to a place prepared for 3½ years ). Oh, and by the way, several people have mentioned a fear of dismissing rapture dates, citing the Parable of the Ten Virgins and the desire to have "oil in their lamps" when the time came. However, as this article on the Ten Virgin Parable shows , it has nothing to do with being ready by being open minded to prophecy theory inventions! Now, if you want to know what Revelation is really predicting through the woman, see my article on the 144,000 and the Woman . Thank you to those reading here that came from the Wikipedia article on the "Revelation 12 Sign"  that quotes me from this article. I am thankful for such exposure. It helps me reach more people with the truth about these increasingly common invented, false prophecies spread on YouTube which worry believers (you should see the emails I get). This article will help you to be able to see that the "Revelation 12 sign" theory is invented and unscriptural and therefore not predictively useful. If you can get out of anxiety and fear from it now, without having to wait for September 24th, that's a win.